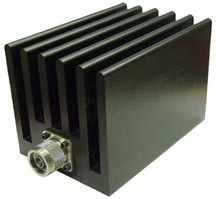 MDI's high power attenuators combine maximum cooling efficiency, along with excellent frequency and accuracy characteristics. A wide variety of attenuation values is offered at all power levels. Consult us if you require power levels and/or attenuation values that are not specifically listed. To determine the actual model number, replace 'X' with required attenuation value in dB. Peak power rating on all units is 2000 Watts. These units require forced air cooling, provided by integral AC fan.